NEW YORK, April 2, 2019 /PRNewswire/ -- OUTFRONT Media Inc. (NYSE: OUT) today announced a campaign designed by its in-house creative studio, OUTFRONT Studios, for Clyde May's Whiskey official launch in Atlanta. This simple yet bold creative was developed to not only raise awareness among trade professionals and consumers of the brand's arrival, but to pay tribute to Clyde May and the legendary whiskey he created more than 70 years ago. Beginning in April through the end of July, Clyde May's campaign will be displayed across eight of OUTFRONT's premium billboards in the Atlanta area, including downtown, at stadiums, and on major highways. The creative is simple and authentic, and captures the brand persona with the tagline, "Most whiskeys have a story. Ours has a legend." "After a long wait, we couldn't be more excited to officially launch in Atlanta and bring our award-winning whiskey to a new market," said Roy Danis, CEO of Conecuh Brands, LLC. "By partnering with OUTFRONT we were not only able to create a campaign that embodies the true spirit of the brand, but are also able to reach a wide audience at the time of our launch in this city." 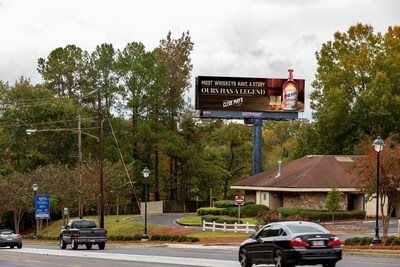 With the goal of informing both trade professionals and consumers of Clyde May's availability in Atlanta, OUTFRONT Studios designed the campaign to encompass the spirit of Clyde May's, complete with a special build that enhances the billboards to include a 4-foot extension to represent the handle of a Clyde May's bottle. "From the very beginning, we understood Clyde May's rich history and crafted a campaign that captured these traditions and values to reveal an authentic, true-to-the-south creative," said Eddy Herty, National Creative Director at OUTFRONT Media. "With this strategically-placed and expertly executed campaign, we can inspire trade professionals and consumers across the Atlanta area to embrace Clyde May's Whiskey and explore new tastes." With its award-winning team of expert creatives and thought-starters, OUTFRONT Studios produces original creative and delivers groundbreaking campaigns that are impactful and engaging. To learn more about OUTFRONT Studios, visit OUTFRONT Studios. OUTFRONT leverages the power of technology, location and creativity to connect brands with consumers outside of their homes through one of the largest and most diverse sets of billboard, transit, and mobile assets in North America. Through its ON Smart Media platform, OUTFRONT is implementing digital technology that will fundamentally change the ways advertisers engage audiences on-the-go.